Long before “Hollywood” became synonymous with the commercial film industry, the area of Echo Park known as Edendale was the center of filmmaking on the West Coast. By the teens, several film studios were operating on Allesandro Avenue (now Glendale Boulevard) along the Echo Park-Silverlake border, including the Selig Polyscope Company, the Mack Sennett Studios, the Pathe West Coast Film Studio, and others. 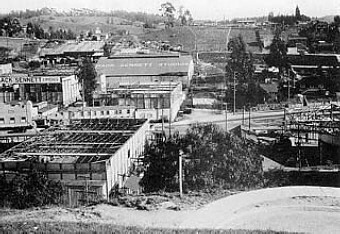 Several silent film stars worked in the Edendale studios, including Mabel Normand, Fatty Arbuckle, and Harold Lloyd. Charlie Chaplin’s first film was made in the Mack Sennett Studios, as well as the very first feature length comedy ever made, which starred Charlie Chaplin and Mabel Normand. The first pie-in-the-face scene was filmed at what later became the Mack Sennett Studios on Glendale Boulevard near Effie Street. The complex, which is now part of a storage facility, dates back to 1909 and includes one of the area’s first permanent sound stages, the factories where movies are made. The former studio, 1712 Glendale Blvd., is City of Los Angeles Historic-Cultural Monument No. 256. The 1913 movie “A Noise from the Deep” (1913) was filmed on the site and included a scene where Mabel Normand tossed a pie into the face of Fatty Arbuckle. The pie toss later became a standard routine in slap stick movie comedies for years to come. Some Edendale residents went on to successful careers in the new industry. Filming continued in several of the studios through the thirties, when most of the industry had moved on to Hollywood and the San Fernando Valley.